When you purchase a Living Swell Gift Set, you not only save money but you also help save the lives of abandoned, neglected dogs and cats that otherwise would have no hope! We could not do it without your help and your compassionate, caring heart. Save money while doing good for yourself -- and doing good for animals! All profits from my Living Swell Gift Sets go to fund my animal welfare work. Very limited quantities, so order today before we sell out (which we do very quickly!). how adorable are these zippered beach bags with matching lightweight beach towels?! Order now to get your first choice! 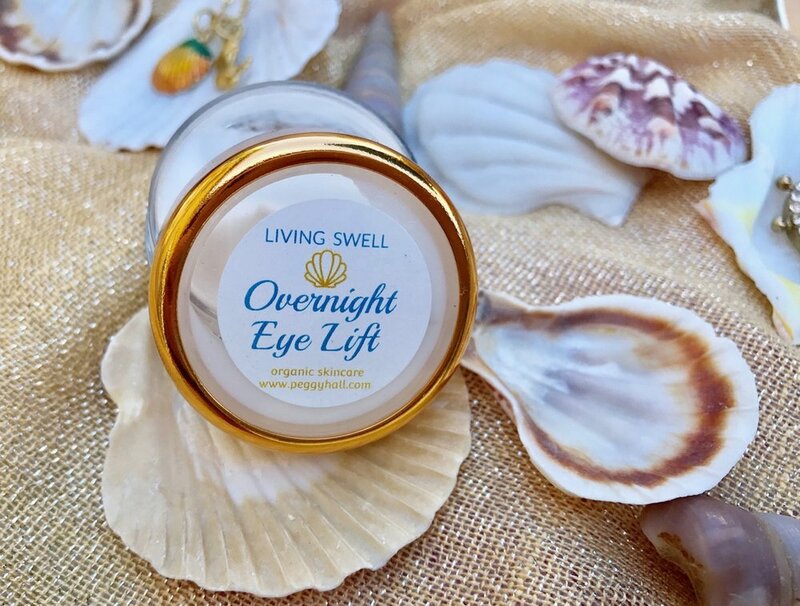 Overnight EYE LIFT -- Hydrating and soothing, this luscious formula diminishes fine lines and dark circles so you look happier, more refreshed and radiant! All-natural formula with hibiscus and marigold extracts. Non-allergenic, no fragrance added. Organic soap Two half-bars (2 oz each) of my luxurious, handmade soap in two different surprise summery scents. You get both! Zippered pouch with lightweight beach towel choose your favorite style, while supplies last! Bonus -- Surprise Mystery Gift! You know how I like to include a little extra something as my special thank YOU! "I just want you to know how much I enjoy your emails and products!! I am always so happy to get the package and grateful for the little gifts you include. I just wanted to tell you how much I love all you do and how happy I am with your products!! I purchased one of your gift sets and love the youth serum, eye lift, heel balm and all the other little goodies! I was also so surprised by the mailing and adorable pictures of the animals you are helping!! Keep up the good work! Many blessings"
Your packaging is creative and I love your sweet touch of adding cute stickers, pen, journal and other extras.